about their health insurance coverage, including whether they had insurance, the source of this insurance and their opinion about Medicaid. Seven in 10 Ohio adults (68%) reported that they have a very or somewhat favorable view of Medicaid. That compares with 2 in 10 adults (19%) with a somewhat or very unfavorable view. Responses to this question varied by political party, though a majority of each political party held a favorable view. Six in 10 Republicans (57%) and Independents (62%) held a somewhat or very favorable view, compared with 8 in 10 Democrats (84%). 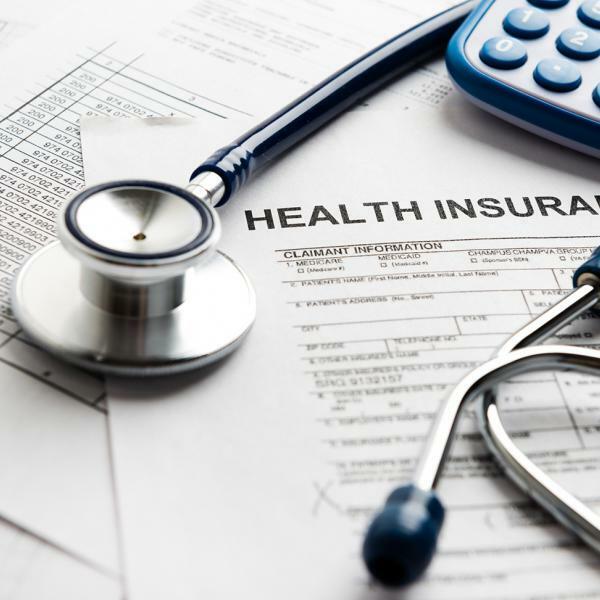 health insurance coverage through Medicare, the data reported in this section reflects results for Ohioans ages 18 to 64.In 2018, 1 in 10 Ohio adults ages 18 to 64 (9%) reported that they did not have health insurance coverage. The percentage of adults without health insurance dropped significantly in both Ohio and in the country when the major parts of the Affordable Care Act (ACA) were implemented in 2014. In Ohio, about 1 in 10 adults have been uninsured since then. Half of Ohio adults ages 18 to 64 reported that they received insurance through their own or a spouse’s employer (50%). This percentage is similar to 2017, but has gradually decreased since 2015. Nearly 1 in 4 Ohio adults (24%) received public insurance, including Medicaid, Medicare, veteran benefits and combinations of the three. Nearly 2 in 10 adults (17%) reported they had insurance from another source, including people who bought their own plan, and people who responded “other” or “don’t know.” These percentages are similar to 2017. Another way to evaluate access to health care is to look at the stability of health insurance. One measure of stability is whether a person has had continuous health insurance coverage for the past 12 months. In 2018, fewer than 1 in 10 currently insured adults (7%) had gone without health insurance at any time in the past 12 months, the same as in 2017.
impact is sustained over time. In addition, assessing public opinion about specific programs such as Medicaid is valuable to inform policymakers as they consider changes to those programs in the future. Interact for Health supports Universal Health Care Action Network (UHCAN) Ohio as it advocates for access to affordable, quality health care for all Ohioans. UHCAN Ohio helps consumers speak out to decision makers about their health care needs, assists consumers during the open enrollment period for the Health Insurance Marketplace, advocates for solutions to Ohio’s significant lack of oral health care access, and educates people about proposed changes to eligibility and coverage for Medicaid health insurance so that people can advocate to their benefit. For more information about UHCAN Ohio, please visit http://uhcanohio.org/. 2. Cohen, R.A., Martinez, M.E., & Zammitti, E.P. (2018). Health Insurance Coverage: Early Release of Estimates from the National Health Interview Survey, January – March 2018. National Center for Health Statistics. Retrieved from www.cdc.gov/nchs/data/nhis/earlyrelease/Insur201808.pdf.